Photoshop has dominated the market since its arrival in 1988.The dominance of product is such that the word “Photoshop” has itself become a verb. It has almost all the features like photo retouching, content aware fill, image editing, smart objects, camera shake correction and a lot more. With almost every feature integrated, it becomes a powerful but complex tool which requires professional hands to work on it. Learning photoshop requires high ramp up time and is not at all meant for novice users. Also you need to pay significant price to purchase the software. However, majority of users just need basic image editing stuff and are not concerned with too many features. So, for those of you who want to do image editing free of cost and with a user friendly interface, we bring you a list of free alternatives to Photoshop. GIMP stands for GNU image manipulation program. It is an open source graphics editor. It supports features such as photo retouching, image authoring, mass production image rendering, online batch processing system, image converter, image authoring etc. It allows you to tailor the view and behavior according to your needs. You can customize widget theme by changing colors, spacing and icon sizes. GIMP offers you a full screen mode which allow users to do editing work and preview their artwork simultaneously. You can also go for advanced photo retouching techniques by using clone tool to get rid of unneeded details or brush up minor details with healing tool. File Formats: JPEG (JFIF), GIF, PNG, TIFF, PSD, TGA, BMP etc. Paint.Net is an image editing software that runs on windows. It has a user friendly interface and an active online community which provides you with latest plugin, online tutorials and helps you with any support related to product. Due to a user friendly interface it is easy to learn and does not take much time to get your hands on. The tab displays live thumbnail which makes it very easy to navigate. The special effect ranges from sharpening, blurring, embossing, distortion, noise and red-eye removal. Fotor i s an easy to use powerful image editing tool. With its simplified approach you can apply advanced photo editing techniques without learning about the ins and outs of graphic editor. Even a novice user can push his creativity to next level without applying much of the efforts. File Formats: TIFF, JPEG, and PNG and many more. Cine Paint is an image retouching and painting tool which is recognized as a tool majorly used by motion picture artists. Cine Paint offers a vast dynamic range of 64 bit RGBA which is a more range that can be displayed on monitor. This extended range lures cinematographers. Cine paint was used in movies such as Scooby-Doo, Stuart Little, Harry Potter etc. File Formats: JPEG, OpenEXR, PNG, TIFF BMP, CIN, DPX, EXR, GIF and XCF. 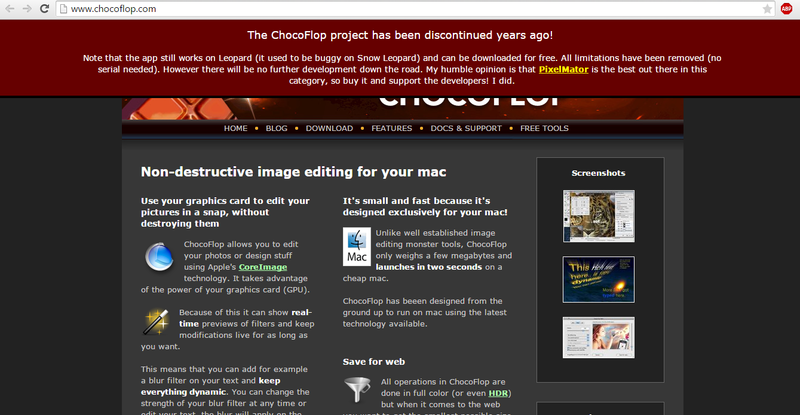 Choco Flop is an image editor which uses apple’s core image technology. It is lightweight and takes few megabytes of space, unlike other image editors. It uses a dynamic approach and can change the strength of filter at runtime which is its key feature, known as non-destructive image edition. It has been designed in such a way so as to use latest available technology on mac. 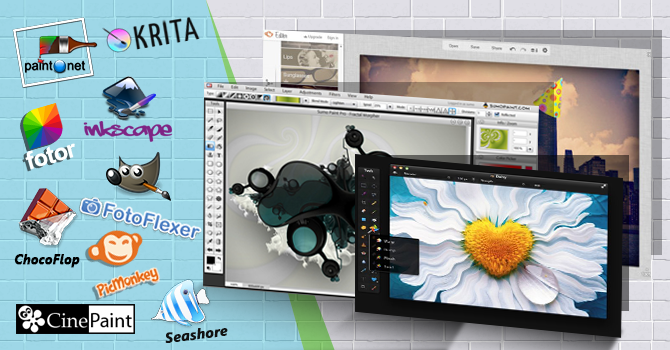 Seashore is an open source imaging tool which runs on Mac OS X’s Cocoa framework. It works on the similar lines as that of GIMP. The tools are displayed on the central panel whereas image data and layers are found in the sidebar. It serves most of the editing features such as alpha channel editing, anti-aliasing for brush stroke as well as text, multiple layers, textures and much more. Krita is a digital painting application for raster images. It is one of the most emerging image editing tool. Krita offer s features like HDR painting, filters, CMYK support etc. It supports wrap around mode to create seamless textures and patterns. You can also make use of advance features like layering to achieve opaqueness or transparency. Inkscape is an open source vector graphics editor capable of creating vector graphics such as charts, diagrams, logos or even intricate paintings. It is primarily used for object creation such as paths (made with pencil which allow free hand drawing), rectangles, 3D boxes, ellipses, polygons, texts etc. It supports more than 40 interface languages. Now let us have a look at few web based image editors which are as capable and furnished as its offline software based counterparts. With these online editors you can edit image from any part of the world, with just a few clicks and a proper internet connection. PicMonkey is a quick way to transform your images with just a click of button. It is a perfect platform to make collage for holiday cards, Facebook covers, blog headers or bundle out few photos together. It saves you a lot of time by bringing a huge selection of one-click photo effects. It allows you to add stickers and overlays to photos by creating labels and buttons on social media. Apart from it you can also choose photo textures, apply effects and themes with many options in an instant. Pixlr is unarguably one of the best online tool for image creation, editing and design. Pixlr provides you with a unique option to blend two images and that too in 11 different blend modes. Also on tray are some awesome arty effects like halftone, crosshatch and dapple. FotoFlexer is known for its effortlessness as most of the features are available at single click. Most of the options available in this tool are in synch with Photoshop which makes it even easier to use. It offers 34 different effects which can be applied on image to achieve greater or reduced intensity. You can save your image on FotoFlexer and can share it on social networking sites such as Facebook. It gives you features like animation (which brings your images to life), smart scissors (cuts a person out of background with few clicks), smart resizing (crops and resize a photo), smart recolor (easily changes color) etc. to deal with graphics. Sumo Paint provides palette of familiar tools. It comes equipped with endless features like filters, 3D effects, brushes etc. It also supports some advance features like layering which gives your image a professional touch. File Formats: BMP, JPEG, GIF, TIFF, PNG. Are you also one of those creative brains; then you must have something to add to this list. Feel free to leave a comment below to let us know of some appealing image editors. Love the list. I’ve been using Pixlr for a few years now. Especially when I’m working on a unit without Ps Installed. It’s really useful for quick edits and can really deliver. And a bonus is that it’s a browser based app.